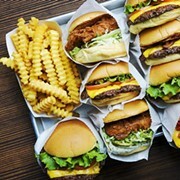 Ohio's first Shake Shack opened this summer at the Pinecrest development in Orange Village. Soon after that splashy opening we learned the the company also would be part of a fresh class of newcomers at Cleveland Hopkins International Airport, slated to open sometime this winter. Now we're learning that Shake Shack will open one of its insanely popular "modern day roadside burger stands" in the heart of it all: Downtown Cleveland. The long-rumored addition was confirmed by company spokespeople this past fall, a help wanted add was recently posted online, and today, the plans were confirmed to Scene by Kristyn Clark, Senior Manager, Brand Communications for the company. This will be a 4,055-square-foot Shake Shack located at 1965 E. 6th Street. When it opens sometime in 2019, the shop will feature all the classics, including the ShackBurger®, crinkle-cut fries, hand-spun shakes and a selection of frozen custard concretes in collaboration with local food purveyors. In keeping with Shake Shack’s commitment to green architecture and eco-friendly construction, the restaurant will be constructed with recycled and sustainable materials. Booths will be made from lumber certified by the Forest Stewardship Council, and table tops will be made from reclaimed bowling alley lanes.